Northerly shipping traffic could enter the New Inlet, which avoided the treacherous Frying Pan Shoals, located 29 southeast of Smith Island. 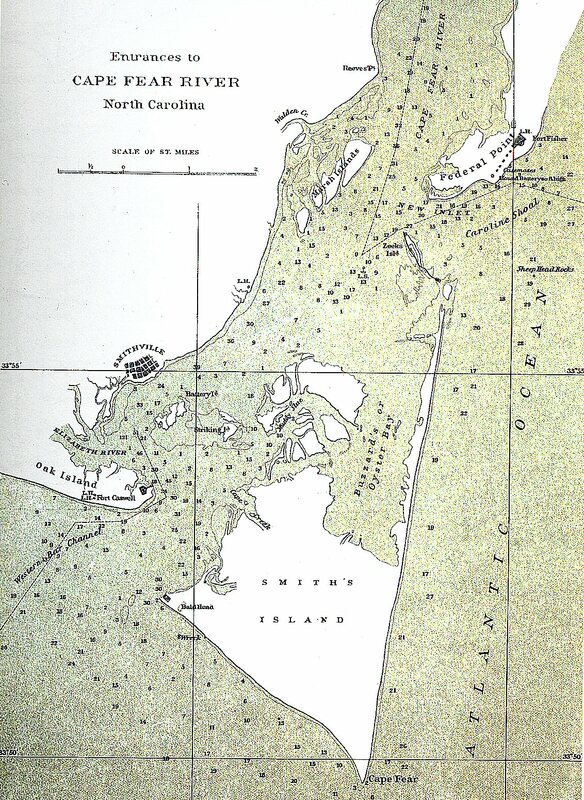 In 1877, a storm opened a breach between Smith Island, commonly called ‘Bald Head’ and Zeke’s Island which Civil War Military Maps recorded as ‘Zeeks Island’ (see the map above). Acquiring seafood on Federal Point was a family affair. On a falling tide or low tide, we would head for the bays located just south of where we lived at 833 S. Fort Fisher Blvd (images). Our family believed that what we called the upper bay was a clamming paradise. The upper bay was east of the Fort Fisher munition bunkers. When the tide was out, the large sand flats would yield clams about the size of a small to medium fist. 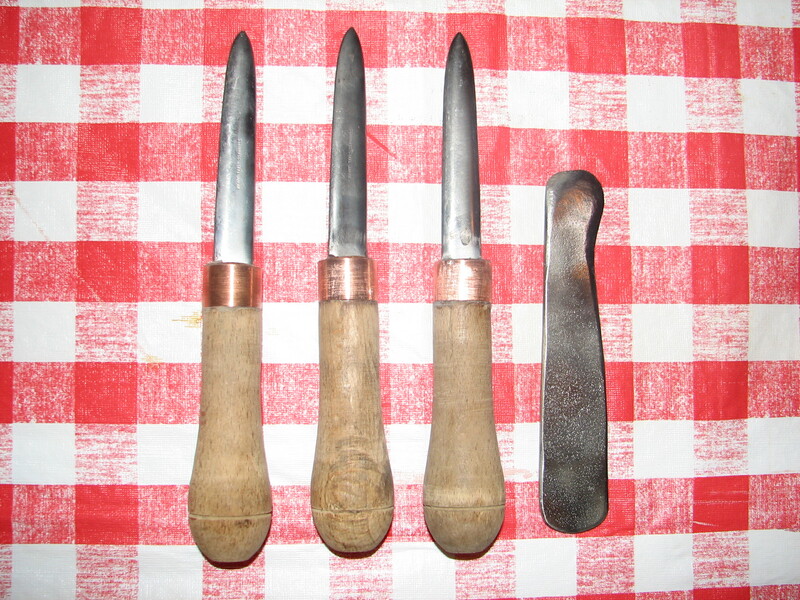 Our tools of the trade were four-prong rakes. You did not have to rake very deep – usually less than an inch. A bubble hole would sometimes indicate the presence of a clam. The resulting designs in the sand from the raking process were quiet similar to “Karesansui” as in Japanese Zen garden art. I assure you that at the time, I did not have any idea what a Zen garden was. The only way our family prepared clams was by making clam chowder. You could go to the bays and get a “mess” of clams and have clam chowder for dinner. Chicken soup was a well-known combatant for the common cold, but in our family clam chowder was used exclusively. There were two methods of oystering that we used. The favorite and most productive was chipping oysters off the rocks with a homemade chipping hammer. With approximately three miles of rocks, there were ample surfaces for oysters to grow. Most of the oysters grew on the bay side of the “Rocks.” The accessibility to the rocks was made available by a concrete cap that was installed in the 1930’s by the Corps of Engineers (Jackson, 1995). The farther you walked out on the rocks, the availability and quality of oysters increased. Prior to moving to Texas in 1956, we went oystering on the Rocks for the last time. On this trip, we came off the rock with four bushels of oysters. Dad and I each carried the inside handles of two bushels while Grandmother and my brother Tom Hewett carried the outside handles. We had to stop from time to time to rest, but we were able to make it to the trailer. The reason I share this particular event is that Grandmother had been claiming her hip had been hurting for a couple of weeks. A couple weeks after the oystering trip we found out she was suffering from a broken hip. My grandmother, Addie Lewis Hewett Todd, was around 70 years old at that time; it could be said that she was cut from some very good cloth – one tough pioneer grandmother. Grandmother lived to be 96 years old. The other oystering method required a boat and a clam basket device that had long handles. Mechanically the mechanism was similar to a post-hole digger. However, instead of two shovel devices there were two baskets that opened and closed with the movement of the handles. I would refer to them as long-handle tongs. This method required positioning the boat over an oyster bed that was maybe two to three feet under the water. You could locate these beds at low tide so at high tide we could position the boat over the top of the bed. This method was more of a hit and miss operation because you could not see exactly what you were doing and you brought up a lot of mud and shells. We had a fire pit made of brick that had a metal plate over the pit. Oysters were placed on the plate with the oyster’s mouth pointing down; joints were in an upward position. Wet burlap bags were placed over the oysters. A fire was started in the pit and when the metal plate became hot a little water was poured over the burlap to get the process started. As steam was created, the oysters would open up their mouths resulting in the liquid inside draining down on the plate, which converted to more steam. Dad would monitor the oysters and would enhance the steam process by adding more water as needed. He always liked to see a lot of steam. Within a short time all of the oysters would be opened and very tender. The oysters were then brought to the table. If wanted you wanted to eat, each individual had to shuck his or her own oysters. When we had guests that were not familiar with the methods of shucking oysters, someone in the family would get them started; most folks were able to quickly get a feel for the process and could be left alone. The shucked oysters went into a cup containing each individual’s favorite sauce mixture. Our family was partial to a melted butter, heated ketchup and vinegar mixture with a little hot sauce. Crackling cornbread was the family’s favorite accompaniment to be eaten along with the oysters. Some of my fondest memories are of late afternoon trips to the river. Dad had purchased some fairly good shrimp nets on one of our trips to Holden Beach in Brunswick County. With the panels from the net he made a seine net with lead on the bottom rope and corks on the top and two staffs on each end. It is hard to say how long it was, but my guess it was approximately four feet high and 150 feet long. We would load the whole family, along with those who happened to be visiting on the flat-bed trailer pulled by our Cub Cadet Tractor and head over to the river using Davis Road. The Davis’ river front property was adjacent to the Hewett’s river front property. Living on a beach with the Atlantic at our door, we had a lot of summer visitors. Visitors who wanted to help would split up into two groups with Dad (Howard Curtis Hewett Sr.) manning the staff closest to the shore. Dad was the director of operations and I was in charge of the other end. We would pull the net out into the river until it was approximately 3-1/2 feet deep. Then we would pull the net parallel to the shore for 50 yards or so; finally, we headed for the shore. The key was to have both staffs arrive at the same time. This process would yield (depending on the conditions) anywhere from a 2-1/2 to a 5-gallon bucket of shrimp. On lean days more pulls were required. Sometimes the Cape Fear River had such an abundance of shrimp that only a short-haul was necessary to fill a 5-gallon bucket. On one occasion, I remember a small wave from a ship going down the channel causing shrimp to jump up on the shore, but I only recall seeing that once. By suppertime, we had shrimp peeled and ready for the frying pan. An eight-foot long sink that was purchased from the surplus sold at the closing of the Army base after the war enhanced processing the shrimp. I recall it being a four-person process consisting of a couple of peelers, a person to devein, and a quality control inspector. The inspector was usually my grandmother because she was noted for her food preparation quality control. When it came to seafood, Grandmother’s seafood preparation techniques put her in a league of her own. I have a special memory about Grandmother Roebuck (Meme) on one of the trips to the river. It was one of those times that we did not have a big group so Meme wanted to help on my end. Actually, I think she just wanted to get out in the water to cool off. On our second pull, we had moved farther down the beach than normal. This area of the beach had more of a muddy bottom than the usual sandy bottom. As we started to shore, Meme got bogged down to her knees in the shallow water. To help her, I had to drop the staff. After getting her legs back on the surface of the bottom, she still could not stand up so I rolled her out of the area until she could stand up. Of course, she was laughing all the way. Now leaving the staff did not make my “no-nonsense” dad happy and I can’t write what he said to me but Meme sat down on the beach and roared with laughter. The more dad fussed with me, the more her laughter increased. To this day I have a hard time not smiling when I think about that afternoon at the river. 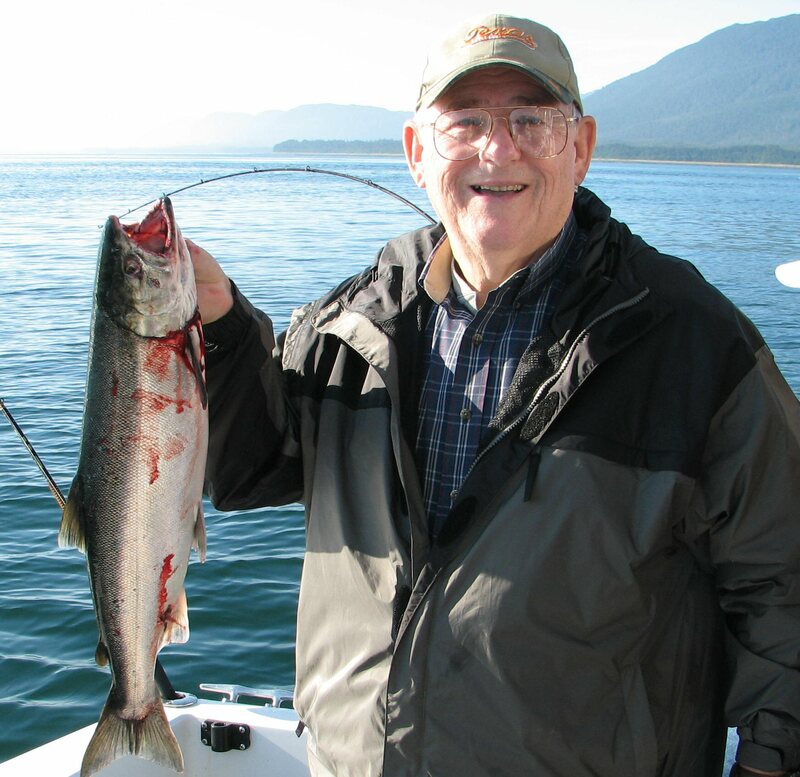 There was an abundance of fish, but the variety depended on the time of year. The fall mullet run provided the family fish for a good part of the year. It was the only seafood that we salted down for short-term storage. When needed, the mullet was removed and soaked in fresh water until most of the brine was removed. Regardless of the soaking, the fish was always on the salty side. The surf provided trout, blue fish, some flounder, croakers and Virginia mullet. Offshore there was an abundance of black bass around the wrecks of the blockade runners. The most prolific flounder fisherman of the family was my Uncle Crawford Lewis. Dad may have been a close second. Their method was to pull a small skiff with a rope tied to their waist along the shallow waters of the bays. 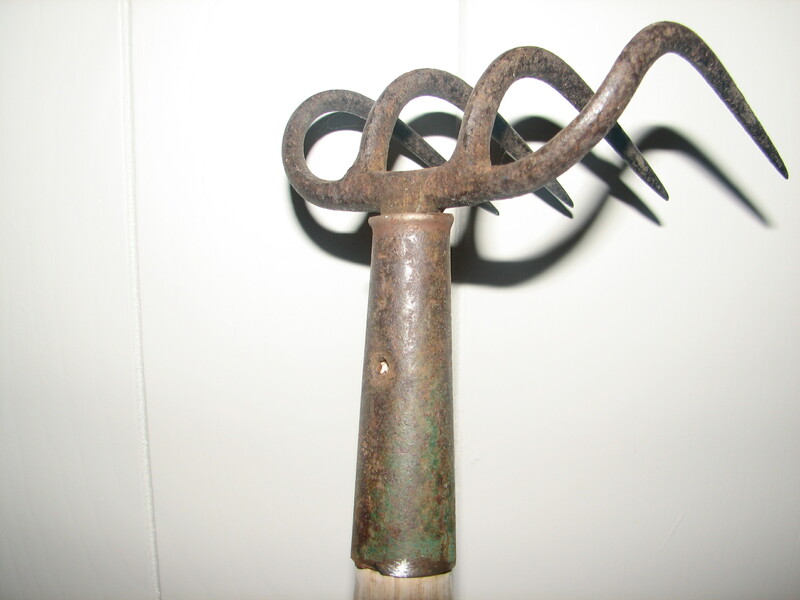 Their gigging tools consisted of a three-prong pitchfork and a gas lantern. With one hand holding the lantern and the pitch fork in the other, they would gig a flounder, set the lantern down on the bow of the skiff and in one fluid motion flip the flounder in the boat without actually reaching down into the water. The quantity was not what floundering was all about. Quality and size were more important. They would be looking for large flounders around 4-5 pounds. Just enough for three families to have baked flounder and sometimes maybe a little fried fish. If the moon and the tide were right, it seemed like they would go every night. This might seem strange, but there was no television back in those days so when it got dark, it was time to go floundering. 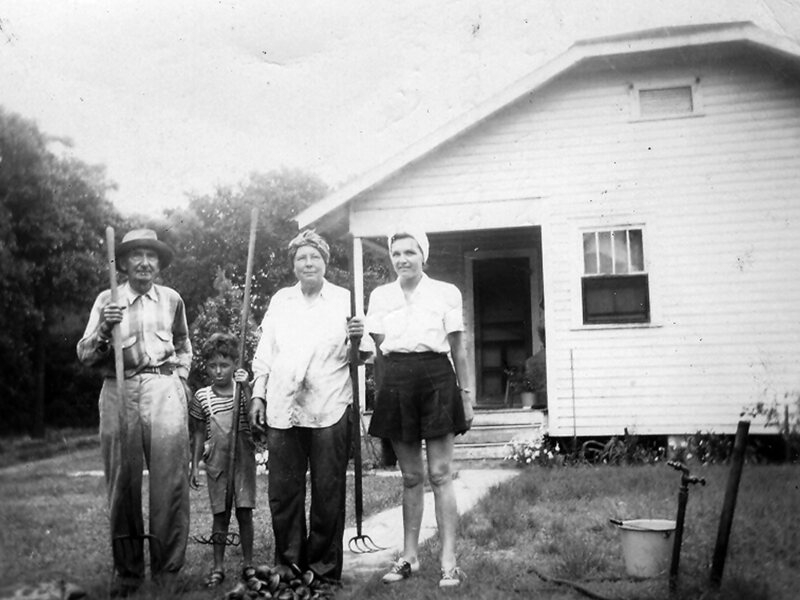 Providing food for a growing family was paramount. The favorite way to prepare the flounder was to bake the whole flounder in a roasting pot with onions and potatoes. I think it is important to say that regardless of the abundance of seafood, we only took what we needed. Davis G. B., Perry, L. J., & Kirkley, J. W. Compiled by Cowles, C. D. (1983). The Official Military Atlas of the Civil War. New York, NY: Fairfax Press. Hewett, H.C. (2014). Fishing off Fort Fisher in a Small Boat in 1940s and 50s. Oral History, Federal Point Historical Preservation Society. Jackson, S. (1995). The Closing of New Inlet (The Rocks) 1870-1881 … and the Swash Defense Dam 1881-1891. Rayburn, R. H. (1984). One of the Finest Rivers in the South: Corps of Engineers Improvements on the Cape Fear River below Wilmington, 1870-1881. Lower Cape Fear Historical Society, Inc., Volume 27, Number 2, May, 1984. Rayburn, R.H. (1985). One of the Finest Rivers in the South: Corps of Engineers Improvements on the Cape Fear River below Wilmington, 1881-1891. Lower Cape Fear Historical Society, Inc., Volume 28, Number 2, February, 1985.